The City of Lake Charles joined the National Flood Insurance Program (NFIP) on October 16, 1979, with the adoption of its floodplain management ordinance, Flood Insurance Rate Maps and Floodway Maps. The information on the flood insurance rate maps was obtained from the studies prepared by the U.S. Army Corp of Engineers under contract with FEMA. The NFIP requires each local government to join the flood insurance program by adoption of the flood hazard rate maps and an ordinance to guide development within the mapped floodplains. Click here for a .pdf version of the City of Lake Charles Floodplain Management Regulations. The City of Lake Charles became a participant of the Community Rating System in 2004 by obtaining a Class 9 rating, which gives the citizens a discount on their flood insurance premium. We save on an average of $200,000.00 each year for citizens due to our participation in the Community Rating System. Please be aware of what flood zone your property is within. Perhaps you are preparing to build from the ground up, add a bedroom or simply remodel. If your property is within a Special Hazard Area, i.e. Flood Zone A or AE, there are specific guidelines which you and/or your contractor must follow. Click here for a .pdf version of the City of Lake Charles Flood Protection Information brochure. Elevation requirements apply to more than simply the finished floor elevation. The National Flood Insurance Program (NFIP) is designed to protect structures and their necessary appurtenances, such as utilities and electrical equipment. In all A Zones (A and AE), regulations require that the top of a structure's lowest floor be elevated to or above the Base Flood Elevation (BFE). Copies of elevation certificates can be obtained from the Office of Zoning and Land Use, located on the 7th floor of City Hall. To find out more about the National Flood Insurance Program, what zone your property may be designated in or should you have flood insurance questions, you can contact your local floodplain manager at the Office of Zoning and Land Use. 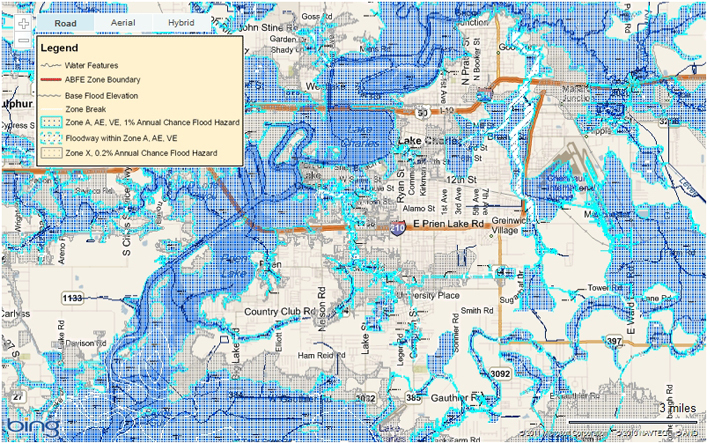 New Flood Insurance Rate Maps effective February 18, 2011.